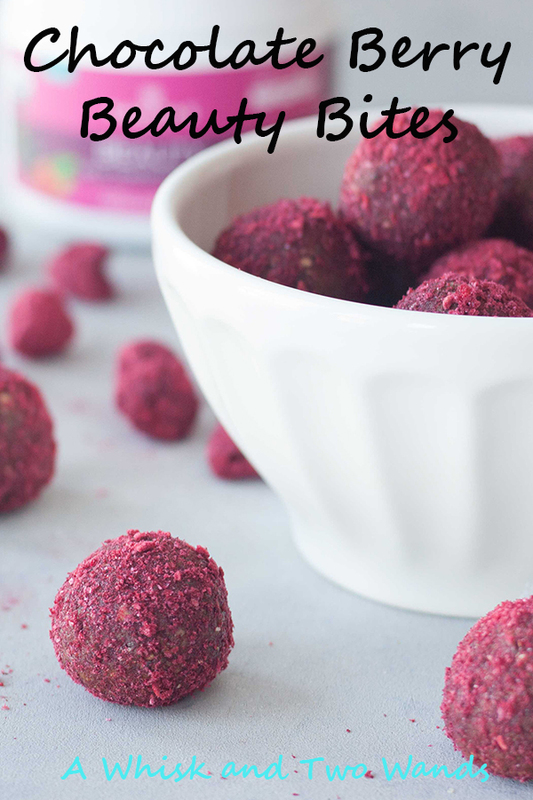 On a roll making snack bites again recently I decided to switch up my Bliss Bites and made these beautiful Chocolate Berry Beauty Bites! I had planned to share these before Valentine’s but better late then never and these are really a delicious treat anytime! I haven’t been the best about keeping snack bites stocked up like I use to but I’ve been getting back on track in the past couple months. Snack balls and bites use to be staples we always had stocked up but when things get busy and there are so many other healthy options it was hard. Not that it’s hard to make them but we do blow through them pretty quick sometimes, other times the stash lasts so long I forget what’s in some of them. I really missed being able to customize them to get in everything I wanted and need so I’ve been making them again but on an as needed basis as what I wanted a week or two ago might not be the same this week. 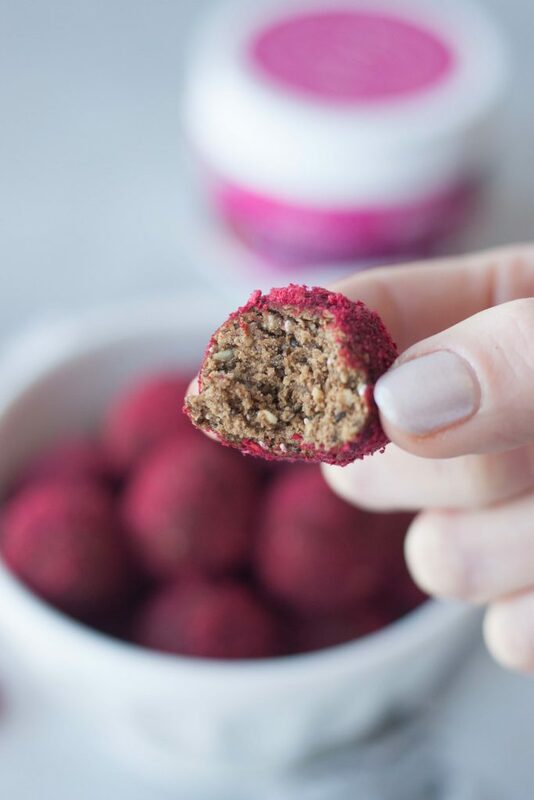 The idea for these came while sipping a Chocolate Berry Beauty Boosted Smoothie, and really you can’t go wrong with chocolate and berries! 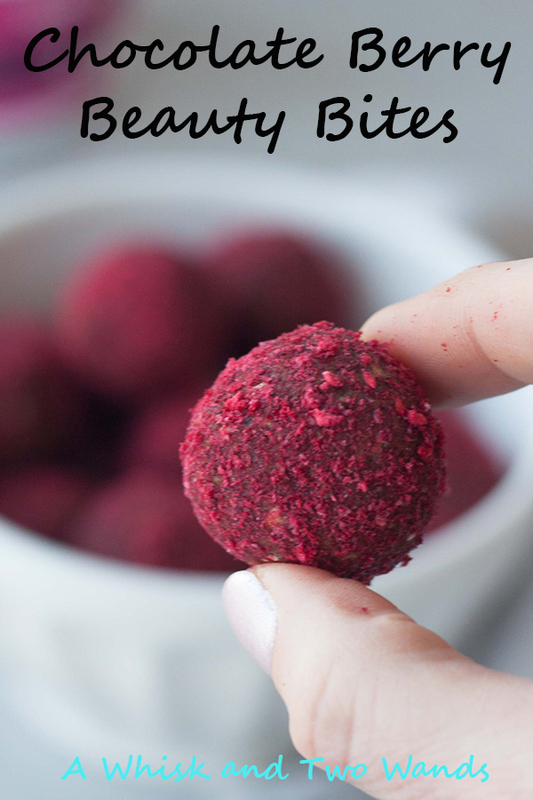 I thought these bites would be a great way to get some beauty boosted benefits on the go, like traveling, when I can’t whip up a smoothie. As I mentioned in my Chocolate Berry Boosted Smoothie post I’m not getting any younger, actually in a couple weeks it goes up, and this winter has been especially brutal on my (and the whole families) hair, skin, and nails. So while I’m reevaluating my skin care regiment I’m focusing more on what I put in my body as that’s where it all starts. Yes what you look like on the outside is strongly impacted by what you put inside. Hydration is a big one and one we are actually really good at in our house, always getting enough eater. We pretty much always drink water like fish and when we don’t we definitely feel it. So next step is increasing foods with beautifying benefits like nuts, seeds, protein, antioxidant rich foods like berries and cacao, healthy fats, vitamins and minerals! I used oats as a base and while these might not have big beauty benefits when consumed they packed many other health benefits that can lower cholesterol, help control blood sugar, and are heart healthy. Healthy carbs, packed with fiber, and a rich source of phytochemicals they’re a healthy addition. Oats are good for beauty however when used for face masks, scrubs, oat baths, lotions, ect. This brings me back to my younger days, I mean like last week, making face masks with oatmeal. If you have any favorite DIY beauty treatments let me know in the comments below I’d love to hear them! Packed with simple whole food ingredients this smoothie is already berry delicious and beauty boosted! If you are looking to add more beauty boosting ingredients I like to also add in a scoop of Navitas Organics Organic Daily Beauty Boost. It’s a powerhouse blend of omegas, antioxidants, nutrients, essential vitamins and minerals, and superfoods to support skin, hair, and nail health. Featuring goji berries, maqui, acai, maca, and turmeric. I happen to have all of these but this makes it easy. It’s great for those not wanting to buy all of them. You can also add a berry powder like acai. Or you can add in any you might have, if you have turmeric and goji berries feel free to just add those. It doesn’t have to be an all or nothing and it’s what you want to do and what you may have on hand. Adding in optional cacao nibs or chocolate shouldn’t be optional but it’s all about texture at this point and the option is yours! 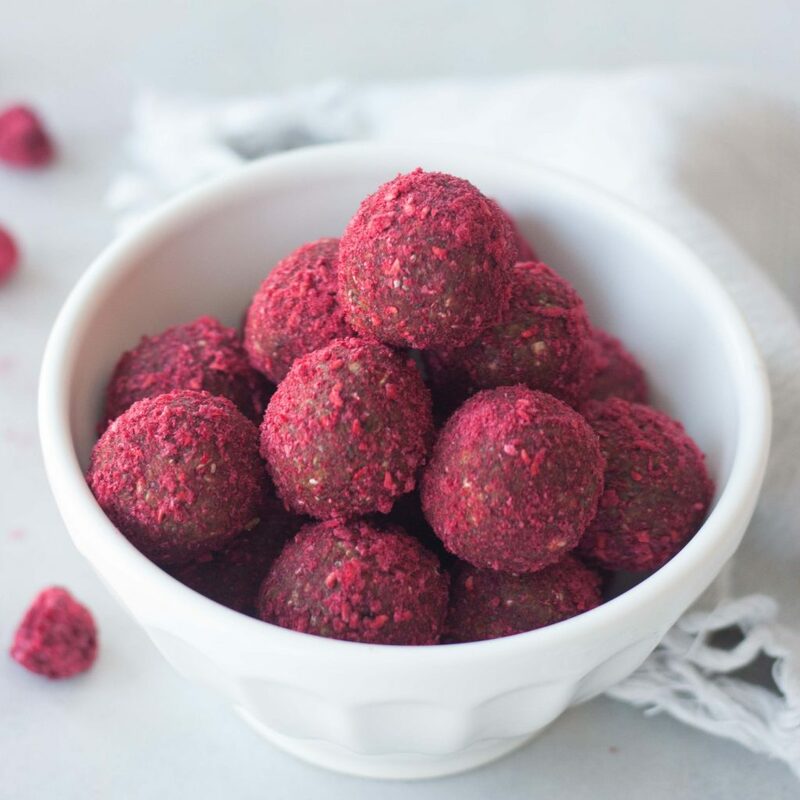 Quick and easy delicious chocolate berry bites packed ingredients to support healthy hair, skin, and nails. 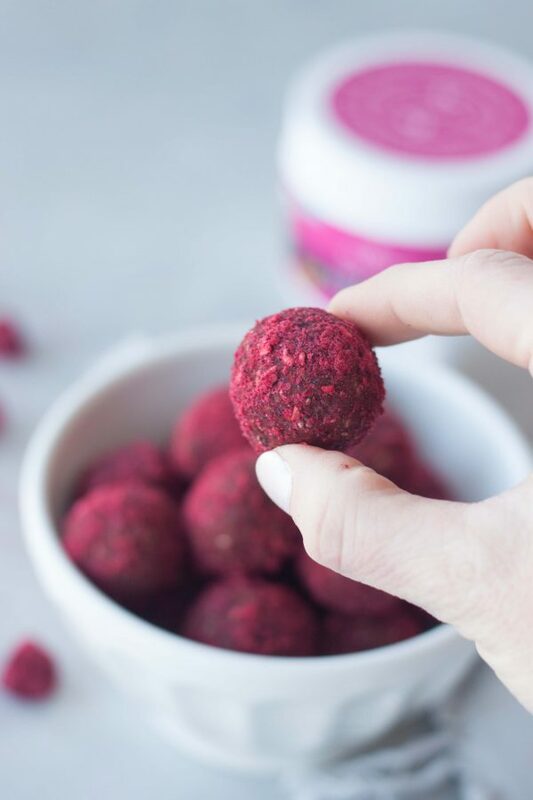 A healthy snack that not only tastes delicious but is customization and supports beauty and overall health. Plant-based, gluten free, and vegan friendly. In a food processor grind oats to a course to fine flour texture. Pulse in protein powder, chia seeds, and any optional dry additions to incorporate. Add in nut butter, liquid sweetener, and coconut oil and blend until it comes together. Slowly adding in water as needed. Roll into 12-15 balls, roll the balls into crushed berries. These are literally the most beautiful bites I’ve ever seen!! The dried raspberries are where it’s at! I could eat A LOT of these…Justy saying! These are so pretty, and they sound so delicious! These look so good! I love the crushed berries on the outside! I agree – you can’t go wrong with chocolate and berries! These look so delicious! They would be a big hit in our house for snacking!